written by Drew Griffiths for MMAUniverse Magazine. Each macronutrient; fat, protein and carbohydrate, plays an important role in the optimisation of both anaerobic and aerobic performance. Moreover, a balanced diet is necessary for well being and health, which in itself is a crucial aspect of the maintenance of high intensity training and performance. Nutrition is a part of every day life for the modern athlete, who aims to maximise his/her recovery, and maximise intensity during training and competition. 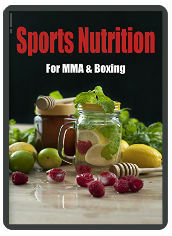 In an attempt to grasp the true significance of sports nutrition, it is first necessary to comprehend the physiological role that each component of a healthy diet plays. The relative utilization of carbohydrates and fats as fuels during exercise depends primarily on the intensity and duration of the activity. In general, carbohydrate use increases with increasing intensity and falls with increasing duration of an activity. However, the absolute amount of carbohydrate and fat used by muscles can be shifted, depending on fuel availability; greater availability of fatty acids increases fat use, and when more carbohydrate is present more carbohydrate is metabolized for energy. This reciprocal interplay between fat and carbohydrate use should be carefully considered when deciding on food consumption for athletic competition. Muscle glycogen is vital, as a fuel for performance. If during the competition, the exercise intensity is increased to around 70%VO2Max, the total energy expenditure is increased, and carbohydrate becomes the major fuel. Most of this carbohydrate, at least in the first hour of exercise, is derived from the muscle glycogen store. If carbohydrate is not available, or is available in only a limited amount, the intensity of the exercise must be reduced to a level where the energy requirement can be met by fat oxidation (Brouns, 1993). Carbohydrate is required by the body as a substrate for the production of ATP. ATP represents the immediate source of energy in a cell; it can be split (and resynthesized) extremely quickly whenever and wherever it is needed. Sugar contains energy in a less readily available form; its breakdown is necessary for the synthesis of ATP. Starch, glycogen and fats contain energy in an even less available state, whereas proteins represent the remotest source of energy which is only used when there is no carbohydrate or fat available. ATP can be derived from a number of patways. When high intensity exercise is undertaken, the ATP-PC system is called upon. ADP, Phosphocreatine (PCr) and enzymes including Phoshopfructokiunase regenerate ATP from ADP.The two main anaerobic sources of ATP are from Phosphocreatine (PCr) and Anaerobic Glycolysis. Intramuscular PCr stores are used for rapid high intensity contractions but are depleted in less than 30 seconds and take several minutes to replenish. PCr provides the majority of the energy for a 100 m sprint. Additionally, the ability to perform repeated bouts of near maximal effort is largely dependent on PCr stores. Augmenting PCr stores by Creatine Supplementation can increase the amount of work that can be performed in repeated bouts of high intensity exercise. Glycolysis, is the first stage in the breakdown of glucose common to all organisms. It occurs in the cytoplasm of the cell. The process of glycolysis produces two molecules of pyruvate for each molecule of glucose degraded. A total energy yeild of 8 ATP occurs. In the absence of oxygen, the pyruvate formed may be converted to a variety of substances to yield a little energy. Anaerobic Glycolysis refers to the breakdown of glucose (glycolysis) to pyruvate, which in the absence of oxygen, is converted to lactic acid. In muscle fibres, glucose is made available through the breakdown of muscle glycogen stores (Toole & Toole, 1999). High intensity exercise with a duration of 1-3 minutes (e.g. 800m race) will rely primarily on anaerobic glycolysis, resulting in a large accumulation of lactic acid. Aerobic glycolysis occurs when oxygen is available to breakdown pyruvate, which yields ATP through chemical reactions that occur in the Krebs Cycle and the Electron Transport System. As in anaerobic metabolism, glucose may be obtained from stored glycogen. Glycogen stores are plentiful, and therefore glycogen depletion is only a concern for athletes who are continuously exercising for more than 90 minutes or intermittent exercise over substantially longer periods of time (Smith, 2002). However, it is not uncommon for endurance athletes to become glycogen depleted, carbohydrate manipulation can offset or delay this occurrence. The most abundant energy source available to the muscle fibre is fat. The breakdown of fat to yield ATP is referred to as lipolysis. While the supply of fatty acids is essentially unlimited, the rate at which lipolysis occurs is the limiting factor in obtaining ATP. Lipolysis is responsible for resting muscle activity, but its contribution to the overall muscle energy supply will decrease as contraction intensity increases. For example, glycogen depletion occurs when the rate of lipolysis cannot meet the energy demand of the exercise, and the reliance on glycolysis expends the available glycogen stores. Once glycogen depletion occurs, exercise intensity will be reduced dramatically. Manipulation of the amount, timing and type of carbohydrate ingested alone, has been proven to enhance performance. In order to understand the relevance of these dietary intervention strategies, digestion and absorption of carbohydrates should be considered. All carbohydrates are mostly broken down to their constituent monosaccharides during digestion. Although some digestion of carbohydrates begins in the mouth through the actions of enzymes in the saliva and in the stomach by the effects of acids, most occurs in the small intestine. Enzymes released from the pancreas into the gut split the larger carbohydrates into fructose, galactose, and mostly glucose. The absorption of these monosaccharides happens in the intestinal mucosal cells where glucose and galactose are actively transported (i.e., energy is expended) with a carrier protein to help them cross the membrane. Fructose is absorbed differently by a facilitated diffusion process that involves a carrier protein but no energy expenditure. However, it is difficult for fructose to be absorbed against a concentration gradient. In other words, fructose absorption will be slowed if there has already been significant fructose absorption. Carbohydrate foods are often classified as “simple” or “complex” carbohydrates-mono- and disaccharides are grouped as “simple” and polysaccharides as “complex.” Although one might guess that simple molecules would be absorbed more rapidly than larger ones, this assumption is not always correct; digestion and absorption do not occur at the same rates for all carbohydrates within a biochemical grouping. A newer system of carbohydrate classification is the “glycaemic index” (GI). The term has been used for some time in clinical nutrition, particularly as it pertains to diabetes, but has only recently been used in the healthy, active population. This term refers to the relative degree to which the concentration of glucose in the blood rises after consumption of a food, i.e., the so-called “glycaemic response.” Testing of the GI requires ingestion of 50 g of carbohydrate from a variety of foods, and measuring the blood glucose response over 2 h. After the blood glucose concentration over the two hours is graphically represented-with glucose concentration on the vertical axis and time on the horizontal axis-the area under the blood glucose curve is measured for each food and compared to consumption of 50 g of glucose as the reference. The glycaemic index is given as a percentage, i.e., the percentage of the area under the blood glucose curve for the test food compared to that for glucose. Accordingly, a GI of 70 indicates that consuming 50 g of the food in question provokes an increase of blood glucose 70% as great as that for ingesting 50 g of pure glucose. Testing of the GI requires ingestion of 50 g of carbohydrate from a variety of foods, and measuring the blood glucose response over 2 h. After the blood glucose concentration over the two hours is graphically represented-with glucose concentration on the vertical axis and time on the horizontal axis-the area under the blood glucose curve is measured for each food and compared to consumption of 50 g of glucose as the reference. The glycaemic index is given as a percentage, i.e., the percentage of the area under the blood glucose curve for the test food compared to that for glucose. Accordingly, a GI of 70 indicates that consuming 50 g of the food in question provokes an increase of blood glucose 70% as great as that for ingesting 50 g of pure glucose. Factors that influence the glycaemic index of a food include the biochemical structure of the carbohydrate, the absorption process, the size of the food particle, the degree of thermal processing, the contents and timing of the previous meal, and the co-ingestion of fat, fiber, or protein (Guezennec, 1995). For example, the ratio of amylose to amylopectin in starchy foods affects GI; the blood glucose response to amylopectin is more rapid than for amylose because the digestive enzymes more rapidly break down the branched structure of the amylopectin. In addition, there is some evidence that amylose is not fully digested; therefore, the full carbohydrate content of a high-amylose food may not be available to the body for use. The goals of dietary intervention is for the athlete are to fill carbohydrate (glycogen) stores in the muscles and liver and to make both carbohydrate and fat readily available in the blood for use by the muscles. Carbohydrate fuel can support higher intensity exercise than can fat and is stored in more limited amounts in the body. The metabolic challenge is to maintain carbohydrate supply to the muscles but to somehow slow its depletion by relying optimally on fat as a fuel. Insulin plays a key role in fuel partitioning because insulin tends to increase the metabolism of carbohydrate and reduce fat use. An interesting question is whether or not certain foods can provide sufficient carbohydrate, affect insulin minimally, and also encourage fat use for energy. Many studies have investigated the ergogenic value of consuming carbohydrate before, during, or after an exercise bout. In 1967 Bergstrom et al demonstrated that exercise capacity is increased with a high carbohydrate diet as opposed to a mixed or low carbohydrate diet. There is no doubt that the ability to perform prolonged exercise can be substantially modified by dietary intake in the pre exercise period, and this becomes important for the individual aiming to produce peak performance on a specific day. Carbohydrate loading and other types of carbohydrate feeding before and during exercise are the only dietary manipulations proven to have a beneficial effect on endurance performance. 36 hours prior to competition, the cyclist’s primary nutritional goal, is to maximise muscle and liver glycogen stores. Ideally 36 hours before competition, the cyclist should be in the final stage of carbohydrate loading. However, a recent study by Bussau et al (2002) uncovered some thought provoking findings. Eight endurance-trained male athletes were asked to eat 10g.day.kg body mass of high carbohydrate foods while remaining physically inactive. Muscle biopsies revealed muscle glycogen content increased significantly (P<0.05) from pre-loading levels of (mean) 95 to 180 mmol.kg wet mass after only 1 day. Densitometric analyses of muscle sections stained with periodic acid-Schiff not only supported these findings, but also indicated hat only 1 day of high carbohydrate intake was required for glycogen stores to reach maximal levels in types I, IIa, and IIb muscle fibres. The subject should eat at least 680 grams of carbohydrate the day before a competition. This will provide the 10g.day(-1).kg(-1) body mass which was incorporated in the Bussau study. Glyceamic index however, appears to have little effect upon carbohydrate loading. In 1988 Brewer et al investigated whether the glycaemia index of carbohydrate influenced the effectiveness of carbohydrate loading, in addition to the absolute volume consumed. One group of participants consumed sweet food, such as chocolate and sweets, whereas a second group consumed high glycaemic carbohydrates such as pasta, and a third group consumed a diet of mixed macronutrient content. It was concluded that the type of carbohydrate was unimportant and had no bearing upon pre race muscle glycogen levels; absolute amount was the crucial factor. On the actual day of the race, the subject should follow a pre race feeding routine which has been tested in training. Carbohydrate feedings 2-4 hours before the race may inhibit lypolysis, decrease the availability of plasma of plasma fatty acids and thereby deprive the muscle substrate. This in turn may accelerate glycogenolysis and increase whole body carbohydrate oxidation (Grandjean, 1994). Large pre exercise carbohydrate feedings may compensate for the excess oxidised carbohydrate by providing sufficient glucose through the blood, whereas small carbohydrate feedings may not provide sufficient substrate and result in premature glycogen depletion and fatigue. Individuals with rebound hypoglycaemia when ingesting, should delay eating carbohydrate until 5 minutes before the race. The evidence suggests that consuming higher-GI foods 30-60 min before exercise causes more of a decrease in blood glucose upon the initiation of exercise and increases reliance on carbohydrate as a fuel during the exercise. These facts tend to identify lower-GI foods as promoting a preferable metabolic response prior to exercise. However, there is conflicting evidence on whether or not these metabolic differences have any effect on endurance performance. Using feedings of C13 labelled glucose and fructose every 20 minutes during exercise, Massicotte et al. (1986) found that fat utilization was higher for the fructose trial during a 180-min exercise bout at 50% VO2max. Also, Flynn et al. (1987) tested blood metabolites and performance of subjects during a 2-h cycling bout when the subjects were fed fructose, maltodextrin, or glucose in varying concentrations at regular intervals during exercise. The treatments that included fructose in the beverage mix maintained blood glucose at higher levels during exercise than did water or drinks with higher-GI carbohydrates. However, neither total amount of work done nor muscle glycogen utilization was different among the different carbohydrate trials. The restoration of muscle and liver glycogen stores is vital for the maintenance of intense training. In 1974, Piehl was the first individual to show the time course of glycogen resynthesis (cf. ), illustrating the rapid glycogen resynthei#sis during the early hours of recovery. Following the cessation of a period of physical activity, blood levels of insulin increase resulting in greater mobility of GLUT 4 receptors. This results in an increased rate of transportation of glucose into the muscle cell. glucose is converted into Glucose-6-phosphate under the catalytic influence of hexokinase; effectively locking the substrate into the cell. Much research has examined the amount of carbohydrate required for recovery of performance. In 1995 Fallowfield and Willaims et al (1995) found that 9g.kg. bodyweight produced greater recovery over a 22 hour period than 5.8g/kg bodyweight, and similar findings were reported by Nicholas et al in 1997. However until recently the importance of glyceamic properties of carbohydrate feedings post exercise had not been established. Burke et al reported that high gylceamic index carbohydrates resulted n higher muscle glycogen levels 2 hours after exercise (as compared to low glyceamic index carbohydrates). Meanwhile, research conducted by Bishop et al in 2000, concluded that high glyceamic index carbohydrates consumed during strenuous exercise, prevented exercise induced immuno-suppresion. The low GI of fructose in addition to its preferential uptake by liver makes fructose a poor post-exercise carbohydrate source (Robergs, 1991), but other biochemical forms of carbohydrates may be more useful. For example, Jozsi et al. (1996) tested two different forms of starch compared to glucose for glycogen replacement. They fed subjects one of four diets-glucose, maltodextrin, high-amylopectin starch, or high-amylose starch-for 12 h following a glycogen-depleting bout of cycling. At 24 h after the ride, muscle glycogen replenishment was lower with the high-amylose starch trial than with the other diets. It was not possible to assess whether the impairment of glycogen replacement was due to a lower GI or to poor digestibility of the high-amylose starch. Unfortunately, the researchers did not confirm whether the diets caused differences in glucose or insulin concentrations in the blood. In another study the same group fed these starches prior to exercise and found no significant difference in GI (Goodpaster et al. 1996). Most sports require that participants possess a high level of both anaerobic and aerobic fitness, and are sufficient in duration to heavily deplete muscle and liver glycogen stores. Manipulation of carbohydrate intake is therefore remains a potential mechanism for the enhancement of performance. Amount, type and timing of carbohydrate feedings are crucial aspects of sports nutrition, and require attention if an athlete is to fulfil his potential through consistent intense training, and high quality performances. For athletes and recreational exercisers looking to make weight for a competition, or lose weight for health reasons, supplements such as carb-killa-bars may be of benefit thanks to their ability to satisfy cravings for chocolate and other sugary foods which if consumed would spike insulin levels and promote unwanted body fat storage.